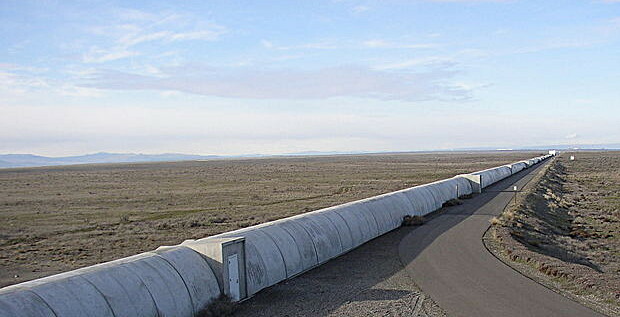 The northern arm of the LIGO interferometer on Hanford facility in Richland, Washington. Aimed to see and record gravitational waves for the first time, it will allow us to learn more about phenomena like supernovae and colliding black holes that generate the waves. Image credit: Cfoellmi via Wikimedia Commons. The California Institute of Technology and Massachusetts Institute of Technology designed the NSF-funded Advanced Laser Gravitational Wave Observatories (Advanced LIGO) facilities and operate them with the goal of observing and recording gravitational waves for the first time. Those discoveries would allow us to learn more about the phenomena, such as supernovae and colliding black holes, that generate the waves. 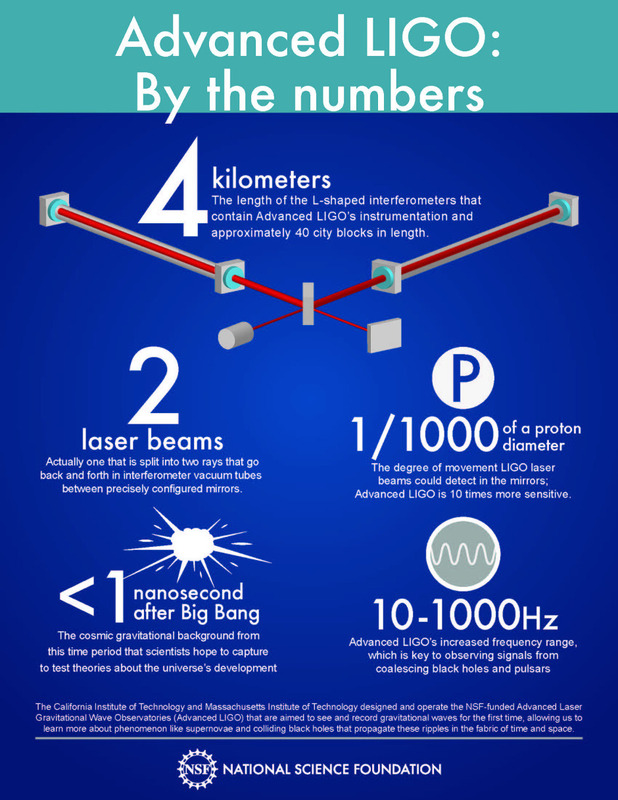 The Advanced LIGO project represents a major upgrade expected to enhance the sensitivity of LIGO’s instruments by a factor of at least 10, creating a one thousand-fold increase in the number of astrophysical candidates for gravitational wave signals. After the May 19th dedication, Advanced LIGO will undergo commissioning to ensure instrumentation is ready for its first search for gravitational waves sometime this autumn. Predicted by Albert Einstein in 1916 as a consequence of his theory of General Relativity, gravitational waves are ripples in the fabric of space and time produced by violent events in the distant universe — for example, by the collision of two black holes or by supernovae explosions. Gravitational waves are emitted by accelerating masses in much the same way as radio waves are produced by accelerating charges, such as electrons in antennas. 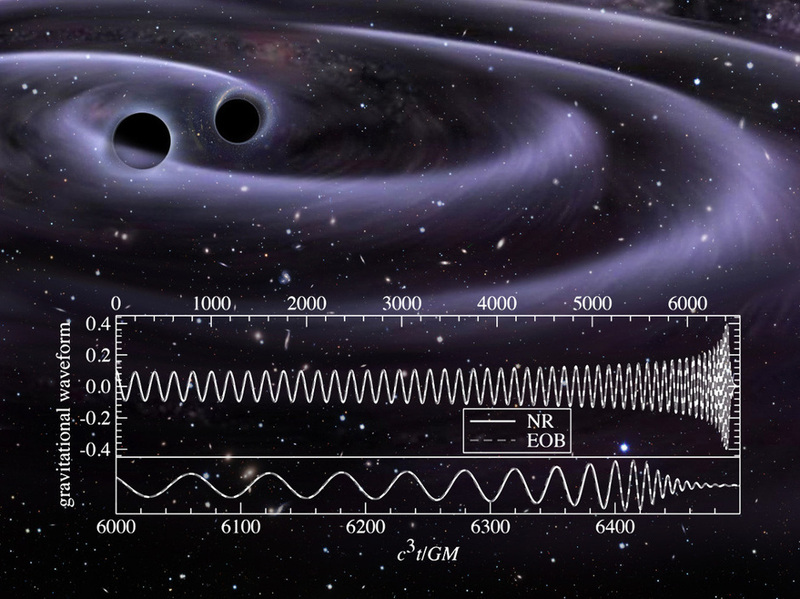 When black holes merge strong gravitational waves are emitted. The graph shows a state-of-the-art comparison between waveforms of a black hole binary calculated according to two different techniques (top panel); the lower panel shows the final few cycles, including the merger of the two black holes. 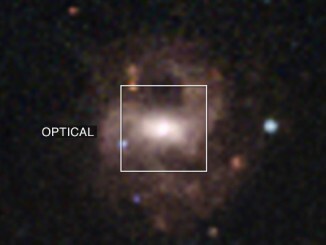 Image credit: UMD/AEI/Milde Marketing/ESO/NASA. Although scientists have yet to detect them directly, the influence of gravitational wave emissions on a binary pulsar system (two neutron stars orbiting each other) has been measured accurately and is in excellent agreement with predictions. In 1993, Russell Hulse and Joseph Taylor received the Nobel Prize for this work (performed in the ’70s and ’80s). Scientists therefore have great confidence that gravitational waves exist. LIGO was originally proposed in the 1980s as a means of detecting gravitational waves. The instrument is comprised of two 4-kilometer length L-shaped devices known as “interferometers” – one at Hanford, the other at the LIGO observatory in Livingston, Louisiana. Inside the LIGO interferometers are vacuum tubes in which a laser beam is split into two beams. Those beams travel back and forth along the length of the tubes, going between precisely configured and very sensitive mirrors located near the vertex and at the end of each arm of the “L.” According to Einstein’s theory, as a gravitational wave passes by, the path the laser beam takes between the mirrors will vary slightly. That change indicates the presence of the gravitational wave. The configuration is sensitive enough to detect a remarkably minute change. LIGO could detect a change equivalent to one-thousandth the size of a proton diameter; Advanced LIGO, which will utilize LIGO’s upgraded infrastructure, will be 10 times more sensitive. “To achieve this improvement, we took many lessons learned from initial LIGO, put them together with the results of worldwide R&D, and made a complete re-design and replacement of the detectors,” said David Shoemaker of MIT, the project leader for Advanced LIGO. To upgrade LIGO to this level of sensitivity required changes in the lasers, optics and several other components and processes. Additionally, these upgrades also significantly improve the instrumentation’s sensitive frequency range and facilitate the ability to tune it for specific astrophysical sources. This will allow Advanced LIGO to look at the last minutes of life of pairs of massive black holes as they spiral closer, coalesce into one larger black hole, and then vibrate – much like two soap bubbles – to become one. The increased frequency range that comes with Advanced LIGO at 10 to 1000 Hertz significantly widens the window to detect signals from coalescing black holes and pulsars that previously couldn’t be observed. The LSC works jointly with the Virgo Collaboration — which designed and constructed the 3-kilometre long Virgo interferometer located in Cascina, Italy — to analyse data from the LIGO, GEO600 and Virgo interferometers. International partners have contributed equipment, labor and expertise, including Britain’s Science and Technology Facilities Council supplying the suspension assembly and some mirror optics; the Max Planck Society of Germany providing the high-power, high-stability laser; and an Australian consortium of universities supported by the Australian Research Council offering systems for initially positioning and measuring in place the optics curvature to nanometer precision. 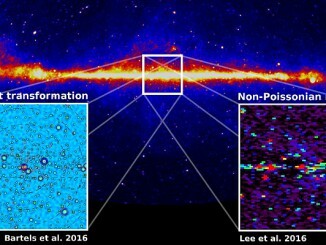 It has been suggested that gamma rays coming from the dense region of space in the inner Milky Way galaxy could be caused when invisible dark matter particles collide, but two new studies suggest that the gamma ray bursts are due to other astrophysical phenomena such as fast-rotating stars called millisecond pulsars. 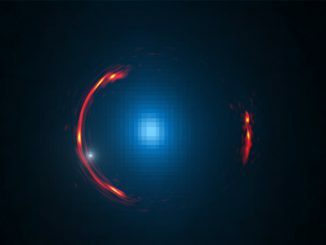 Astronomers using NASA’s Chandra X-ray Observatory and the 6.5-metre Clay Telescope in Chile have identified the smallest supermassive black hole ever detected in the centre of a galaxy. This oxymoronic object could provide clues to how larger black holes formed along with their host galaxies 13 billion years or more in the past.